Marines Disarmed for Panetta Visit: Why? This entry was posted on Friday, March 16th, 2012 at 07:15 and is filed under Defense, Military Affairs, News, Politics, Veterans, War. On Wednesday, the story came out that Marines in Afghanistan had been disarmed for the visit of Secretary of Defense Leon Panetta. Many were puzzled or disgusted over this, for the implications about which it speaks volumes. If the Secretary of Defense is that worried about our own troops, perhaps he should not be serving in that post. Of course, I have a feeling I understand the real reason for this policy, and it may not be about our troops, or at least not all of them. Could it be that Secretary Panetta doesn’t want to be scored as another victim of military “workplace violence,” should another Muslim soldier angry about recent events try to act out his or her anger? I offer this only half in jest, because the behavior of leadership in this case is perplexing. I don’t understand why the Marines were treated in this way, and it can hardly inspire confidence in our service-members if they are led to doubt whether they have the full trust of the chain of command. As we know, the Obama administration has done its best to sweep Army Major Nidal Hasan’s act under the carpet by labeling it as “workplace violence” rather than as an act of terrorism, despite all of the evidence demonstrating the link between Hasan and militant Muslim extremists. I was astonished to learn about the details of Panetta’s visit, and that our own Marines were disarmed allegedly because our Afghan allies who were in attendance were likewise disarmed. As an Army veteran myself, I could see why the security details of dignitaries might have some concern, particularly in the aftermath of the incident last weekend with the soldier who went on a shooting rampage, killing sixteen Afghan civilians, but I also know that was an aberration and says nothing about the entire force. I wonder if the Obama administration knows how much contempt it has wrought by that classification. This sort of thing has ramifications not only for soldiers in the field, but the whole force structure’s confidence in the chain of command. Perhaps that is part of the trouble here: Being near a large military base, I’ve heard an unusual number of grumbles about the chain of command and its general temperament with respect to the military. That’s never a healthy proposition for the military, and I know the lower end of the chain of command struggles to tamp down that sort of thing. Still, I’m certain the Obama administration is conscious of the growing displeasure from some wider body of the military. The budget cuts, the ridiculous rules of engagement, and all the over-tasking our service-members now endure are adding to the strain. I wonder if this was the idea of Panetta, or his own staff, or whether it was the product of an abundance of caution on the part of local commanders. Either way, it signifies a break-down in the long-established and traditional notion of trust between civilian leadership and the uniformed services, and I find it atrocious on all counts. I remember being visited in the field as a young soldier by dignitaries including the Secretary of the Army, John Marsh, under Ronald Reagan, and we didn’t put our weapons away. Of course, that was a different environment, or under different global conditions, but it was also a far different chain of command that viewed its fighting men and women with reverence. Unless they had real and specific concerns, this will only serve to have widened the gulf in confidence between civilian leadership and our military, and that is never a happy development for the United States, or its Armed Services. One Response to Marines Disarmed for Panetta Visit: Why? Why? Remember Hillary dodged mortar attack in Bosnia, Clooney dodged missile attack in Sudan. Where others missed maybe Panetta feared some kind of successful attack and a quick burial at sea. Eh? Seriously though… in a word… for this act by Sec., atrocious. And I read the news story that field commanders called for it. Bidding of Commander in Chief maybe? 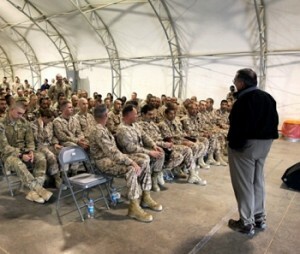 Order…there will be no more workplace violence during Panetta visit, be civil now.